Having recently lost my mother, this book struck a chord in my heart immediately. As I began reading I had an uncanny sense that this was exactly the book I was supposed to be reading, to help me with my own grieving, and to help me sort out my feelings about my mother's death--and her life. My blog is dedicated to the memory of my mother (I may add a formal dedication at a later date); I've connected my mother to my blog since its inception (she was a great supporter and even left a few comments, incognito), and she was, up until her illness, cancer, overwhelmed her entire being, always positive and encouraging about this endeavor. "Now that I was back in the real world, the dream didn't seem so sad. The sense of my mom, of her presence, kept radiating warmly through my chest, though I still didn't feel any affection for the town where I'd grown up." 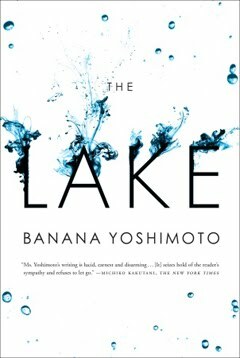 The Lake by Banana Yoshimoto was originally published in Japanese in 2005, and was translated into English by Michael Emmerich in 2011. The book is the story of a young woman, Chihiro, who moves to Tokyo after the death of her mother. She is deeply saddened by the loss, but also feels at the age of twenty-nine a sense of freedom in a new city where she's unknown and works as a muralist. At the beginning of the book, Chihiro, the protagonist, states that she has just had a dream in which her deceased mother spoke to her, enveloped in a beautiful haze. (I dreamed my own mother was in a small, white car the other night, and I hope to see her in another dream soon.) After the mention of the dream the narrator reminisces about her mother's hospital stay and romance with her father, and other events central to her mother's life. This novel made me miss my own mother, but also brought to mind her lasting presence and influence in my heart and mind. Windows are important in this book--perhaps they represent the barrier or pathway between inner and outer life, or something of that nature--and Chihiro gazes out her window at a young man she has grown to like, who is also gazing back at her just as often. From their respective windows, they very slowly begin a sweet romance. Chihiro finds Nakajima quite beautiful (in an offbeat way). His mother is also deceased, and Chihiro knows he misses her love. "And I could see that no one else in the world would ever be able to love him the way his mother must have loved him." Gradually, Chihiro and Nakajima fall in love and begin to spend more and more time together. When Nakajima wants to take Chihiro to the lake to meet two of his friends, Mino and Chii, who live in a tiny, tidy house, Chihiro senses that this is a very emotional event for Nakajima, which may help her to understand him better. At the shimmering lake, Chihiro is captivated by Nakajima's unusual friends; she understands how special they are, and greatly appreciates the wonderful tea Mino brews for her, a simple yet great pleasure. Unpretentiously written in plain language, this reflective book is about our relationships with the important people in our lives--parents, significant others, friends, ourselves. The author's characters are quirky and reflective and likable. Banana Yoshimoto once again demonstrates a beautiful simplicity of expression, even of the most profound subjects: death, love, and friendship. Good news! Melville House Publishing generously gave me an extra copy of The Lake to offer as a giveaway. Because I have readers around the world, this giveaway is international. For an extra chance, name a simple pleasure you enjoy. Enter by 5PM PDT on Monday, August 1. One winner will be randomly selected and announced on Tuesday, August 2. 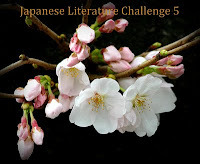 This is my first review for the Japanese Literature Challenge 5, created and hosted by Dolce Bellezza. Special thanks to Nathan from Melville House Publishing for sending me these books. Susan, Happy to hear that this book brought you some comfort since the loss of your mom:( I read it, and enjoyed it as well. Thanks for the giveaway! I'd love a chance to win :) Glad you liked the book! Oh, I think I need to read this one! I, too, lost my mother to cancer. It's been 3 years, now. I didn't even realize it for a long time, but I was so depressed that I completely quit life. I didn't even go out to buy groceries and laundry would sit till my husband was begging for me to clean his socks (or give up and wash them himself). I'm so glad I finally emerged from that bizarre cloud of despair that I didn't even realize I was in for such a long time. And, I'm happy to know the book was right for you for the moment. Losing parents is hard. I've lost both of mine, now. I'm a follower, as of 2 minutes ago. I found you through your comment at Bellezza's blog. To link your review, just click on the cherry blossom photo at her blog (you have to page down a bit) and it'll take you straight to the proper page. Thanks for sharing your reactions to this book. It makes me curious about whether it would bring me some closure at losing my mom, too. Sounds very good. Bookfool, thank you for being so helpful. I am now linked properly to the JLC-5. I appreciate all the comments and welcome more. I shared the same sentiments! I lost my mom to cancer five years ago; and I could relate to Chihiro whenever she grieves for her mom. And, I just love Banana Yoshimoto's prose. The way she writes is simply beautiful. This sounds like an absolutely beautiful book. I have yet to read anything by Banana Yoshimoto and this would be a good one to start with. I'll post this giveaway on my blog. I am reading the eBook version of this :) This was a very beautiful review and such a heartfelt one, Suko! I am really sorry for your loss, I am sure your mom was an awesome person to have been so optimistic and encouraging. May her soul rest in peace. Sounds like quite a different read from what I am used to. I lost my dad not mom to cancer almost 3 years ago now. Sorry about your mom I know how hard it is. One of my simple pleasures is watching all the birdlife around the house especially in spring. We have a number of feeding tables and sunbird feeders and get an amazing variety of birds. i am glad to read the review of this book you have previously mentioned. my mom died two years ago and now i really want to read THE LAKE as there arent many novels about the situation. thank you! walking in nature; a simple pleasure. This sounds like a wonderful book. I'd love to be entered. A simple pleasure - feeding the stray cats outside my house and seeing them enjoy lying on my deck sunning themselves. You wrote a very beautiful post, Suko, and loving words about your mother. I'm happy if this book helped you, and hope you'll dream soon of her, if it's good for you ! This book seems really a nice one. Ididn't read often japanes books, but I'll begin! A simple pleasure : watering my flowers and take care of them ! I had no idea that this blog was dedicated to your mother, but I think that is the most inspired and loving thing that I have ever heard! She must have been so proud of you. I really would love to read this book. Yoshimoto is one of those authors that I have always been compelled to try, but this book in particular really sways me. Thanks for hosting this great giveaway. I would love to be entered. Hi! I follow your blog via GFC. A glowing tribute to your mother, I'm glad this book struck such a chord for you, it sounds like you found some comfort in its words. Please include me in your giveaway. As always I have added it to the comp/giveaway page on my blog and will add it to FB. Good luck everyone. So sorry to hear about your mother. My father has been gone almost 12 years, and he's a frequent visitor in my dreams. I'm so glad this book spoke to you and helped you a bit with your grief. It does sound very good. I'd love to be entered in the giveaway. I'm a follower and I posted the giveaway in my sidebar. Also, my simple pleasures are just sitting in the same room with my family, reading, and word search puzzles (I am so addicted to them!). Your words to your mother were beautiful. Enjoyed you posting and your review. Not entering the giveaway, just commenting on the blog. Thanks for sharing your story about your mom. I would definitely add this to my TBR. I have read a lot of good reviews about this book. It is truly profound when a book that is seemingly an ordinary novel tends to open up something deep within us, and resonates with us in a way that is beyond our comprehension. It is when an author is able to transcend the boundaries of the pages of the book, and create a story that permeates into your life that you know that he or she has truly succeeded at writing a fantastic novel. Banana Yoshimoto is just such an author, it seems. I absolutely love stories that speak of human emotion, strength and psyche, and this book seems like just such a book, and it would be an honor to read/win it! The loss of one's mother is a life-changing event, for sure - one that I don't think I will ever get over. There are so many memories - white butterflies in the spring, the smell of baking biscotti, or the empty seat next to me that would have been hers at graduations and birthdays. My pleasures: Listening to my almost-grown children talking to each other, discussing adult issues, repeating one-liners from movies they watched together growing up, and laughing over childhood memories. Precious! A lot of hype on this book. Count me in! Suko, I am so sorry to hear about your mother. It is special when a book awakens in us something about ourselves. This sounds like an emotional read. Very interesting. A simple pleasure I enjoy is just smelling coffee. I love to walk by a cafe with it's aroma of fresh ground/brewed coffee. Even if I don't have time to go in a get one the smell just puts a smile on my face. What can I say, I love coffee! I'm sorry about your mother Suko. I'm glad that youw ere able to connect with this book and find some comfort. +1 A simple pleasure: A clean, quite house, Sophie curled up next to week sleeping lightly, & a good book. I love the whole concept of this storyline and would love to read this book. This is an author i'm interested in & i have kitchen on my shelf, so please enter me into the giveaway. I am sorry to hear about the passing of your mother. I too lost my Mother three years ago after a long illness (cancer) and still cannot believe that she is really gone. It is heartbreaking to lose a parent.